Diana Edwards has revised this rosemaling text with all new projects. 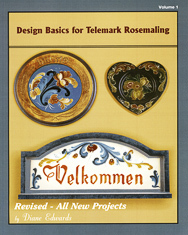 The book offers basic information on designing Telemark rosemaling for beginners and intermediate painters of rosemaling. Strokes, color mixing, designing, and basic backgrounding information are included, with designs for 19 rosemaled pieces. Edwards taught Swedish folk art painting at the Vesterheim Norwegian American Museum in Decorah, Iowa, in 2012.